MIT researchers have devised something they call the Solar Concentrator which is to be placed on top of existing solar cells. Its purpose is to separate the visible and infrared spectra of light by absorbing the visible spectrum and routing the energy to specialized cells. They claim this could lead to doubling the panel’s efficiency and greatly reducing costs. We have seen many promising advances to solar panel efficiency in the past few years, but what is special about this one is the amazingly simple and cheap technique. Essentially, all the team has done is coat a piece of glass with simple organic dyes. 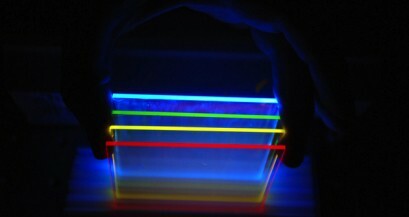 After the organic molecules absorb the visible light, they remit the energy to the sides of the glass where it can be routed to their specific cells. The process is more efficient because the dye absorbs the light rather than something expensive like silicon. That means less silicon, and thus a better price range. Also, the fact that this material is just a piece of glass also opens up the possibility of solar windows. Our post about what it takes to convert your home to solar power probably put you in a green mood, but if you want to start with something smaller, check out this guide on how to add a solar panel to your lawnmower. 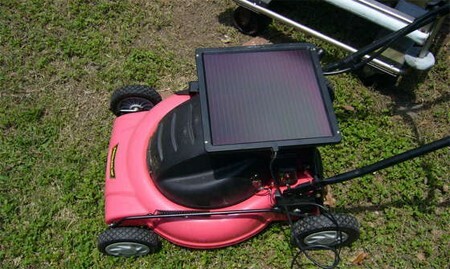 You will need a battery-powered lawnmower for this, as well as a 12-volt solar charger with a car lighter jack. This easy hack mainly involves a small amount of work with the wiring; the car lighter jack must be removed from the solar panel so that the wires can be attached to the batteries. Yeah, that’s it. We’d love to see a more elegant solution since the way it is now you have switch the wiring from parallel to series everytime you want to mow. For a more complete lawnmower hack, check out this remote control lawnmower. 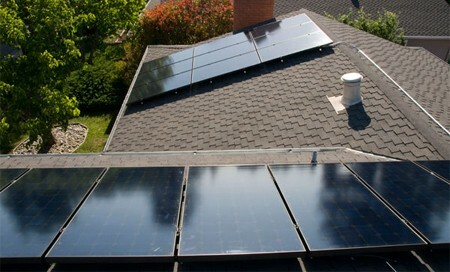 ExtremeTech has posted an article detailing the process of adding solar power to a house. The author included some interesting detail about his personal power consumption, and details about the process of selecting his contractor too. The total cost of the installation came to about $36,000 after state and federal rebates for going solar. It’s not a homebrew setup, but it’s good to see an article detailing all that is involved. We’ll take you through the tech side of it after the break.